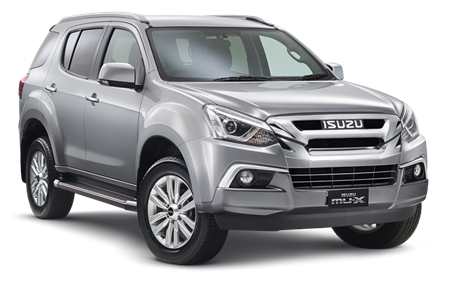 Whether you’re driving in the city or the country, the 7-seat Isuzu MU-X is always ready to impress. Striking LED Daytime Running Lights (DRLs) and Bi-LED projector headlights with auto-levelling functionality let you stand out on the road and are standard on all models. Fog lights spread light wider in difficult weather conditions, making sure you don’t lose sight of the road verge. Standard on LS-U & LS-T.
Side steps not only enhance the tough exterior look, they make it easy to get in and out. Standard on LS-U & LS-T. Stylish alloy wheels are a great looking design but built tough for all terrains with LS‑U & LS‑T featuring 18" alloys and 16" alloys on the LS‑M. The Isuzu designers have taken inspiration from Japanese culture and integrated the elegant curve of a Katana (a traditional Japanese sword) into the doors of each and every MU-X. Electric fold-in mirrors protect you from accidental bumps in car parks or through forest trails. A large design for easy vision out the sides. Complementing the modern styling, the 7-seat Isuzu MU-X is packed with features to help you take command of the road. 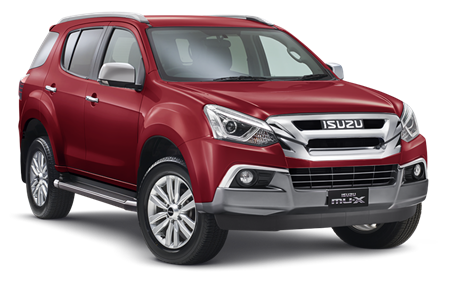 The MU-X comes in a variety of stylish colours that look just as good in the city as they do cruising down off-road trails. A-pillar assist handles make access even easier and help brace yourself when the terrain gets rough. The electroluminescent multi-information display (MID) gives you a clear view to a range of important information. Fuel economy, range, maintenance & distances are all displayed on an easy to read screen. MU-X has an abundance of clever storage compartments, like dual glove boxes, upper dash storage and plenty of cup holders. The comfortable leather bound steering wheel puts audio and cruise controls at your fingertips, so you can concentrate on the road ahead. Control all of the side windows with a simple touch of a button from the comfort of the driver's seat. Features include one touch up/down on driver's side and jam protection. You can drive through blinding snow or blazing sun and still feel completely comfortable using the MU-X electronic climate control system. Standard on LS-U & LS-T. 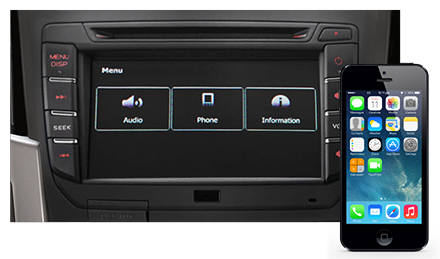 Your entertainment needs are at your fingertips with SatNav, Bluetooth® audio streaming†, iPod®& USB connectivity are all included along with CD, MP3 & AM/FM radio. Standard on LS-T & LS-U. 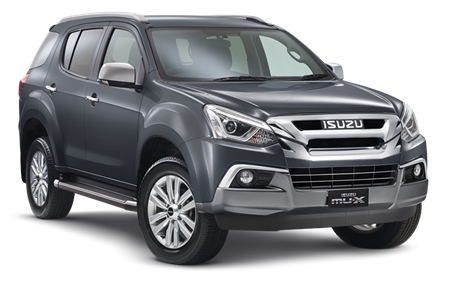 Cloaked behind the sleek exterior of the 7-seat Isuzu MU-X lies a smartly designed interior that creates space for the whole family — and then some. Our LS-T model has luxury leather accented seats§ and the driver’s seat is six-way electric adjustable. The entire MU-X line up features large, comfortable seats with adjustable head rests. Wide door arches make access for all passengers a breeze. There's space for the whole team with seven-seats standard across the MU-X range. Clever split/fold rear seats in both the second and third rows means that no matter what configuration you choose, you will have plenty of seating options and huge amounts of storage. In the top of the range LS-T, you’ll find a roof-mounted 10” video monitor viewable from the rear seats – perfect for those long trips. You can drive through blinding snow or blazing sun and still feel completely comfortable using the MU-X electronic climate control system. Standard on LS-U & LS-T.
Our LS-T model has luxury leather appointed seats§ and the driver’s seat is six-way electric adjustable. The entire MU-X line up features large, comfortable seats with adjustable head rests. While you're having fun behind the wheel, the D-MAX has also been designed to keep you entertained. Get a premium audio experience with Sky Sound, our roof-mounted surround sound system. Plug your iPhone® or other USB devices directly into the audio system so you can play music or simply charge it up. For extra convenience when reversing into tight spots or hitching a trailer. For a safe hands-free experience, let your phone talk to the speakers via Bluetooth®. You can also stream music from various devices† for quick and easy listening of your favourite tunes. 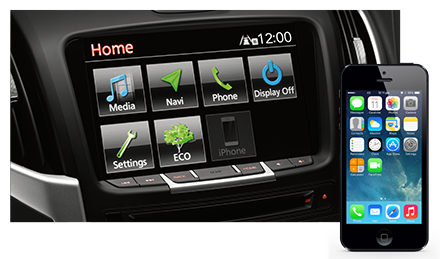 An eight speaker touchscreen display audio system is standard on MU-X LS-M models. The Bluetooth® word mark is owned by Bluetooth SIG, Inc. iPod® is a trademark of Apple, Inc. †Not all devices will be compatible and functionality may vary depending on the device. §Seats have leather touches or accents (excluding third row), but are not wholly leather.